Megaflex Series 75 Manual Pinch Valves are ideal for reliable operation, long life, and low maintenance. The valves are constructed with a fabricated steel body, and double acting ACME threaded pinch mechanism which closes the sleeve on centerline.Red Valve Megaflex Series 75 Manual Pinch Valves maintain a smooth venturi when closing, with no obstruction to flow. The valve is a true full ported design with no crevices or dead spots to bind valve cooperation.Megaflex Series 75 Manual Pinch Valves eliminate packing, bearings, and shafts, so maintenance is virtually eliminated. Fully closed, Series 75’s have drop tight shut off and seal on solids.Because the flexible sleeve is the only part exposed to the line fluid, alloy bodies are not required, and maintenance of shafts and stems is eliminated. The valves break away torques always remain constant. 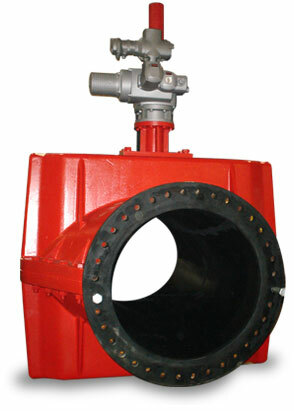 Large diameter Series 75’s are heavy duty, maintenance free valves. Electric actuators are frequently mounted for remote operation. Series 75 Megaflex Valves are available in standard ANSI flange.